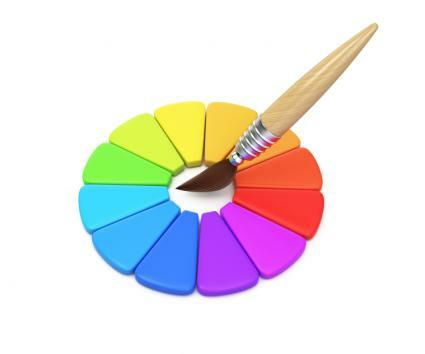 Paint color charts are often referred to as a color wheel. However, a basic color wheel depicts the primary and secondary colors. There are thousands of color values in between. 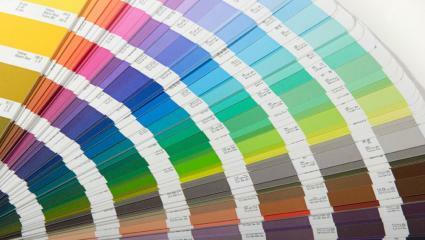 Each paint company produces a paint color chart showing the paint colors they offer. Colors are considered either warm (red, orange, yellow) or cool (green, blue). Depending on the value, purple can either be a warm color (magenta) or cool color (violet). Once you understand the color wheel, you gain a sense of the best matching colors. You can quickly see how to match up warm and cool colors for color balance. You can also easily decipher which ones are complementary colors. 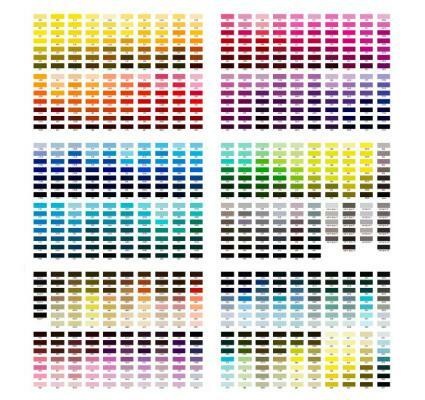 Color charts are also called color references. This is a flat card that is printed with paint color samples. These come in various styles such as page charts, fans or swatchbooks. Interior designers use these paint chip samples, but they are also available to other industry professionals as well as individual customers. Color charts are typically free and can be found in paint stores or big box hardware stores that also sell paint. 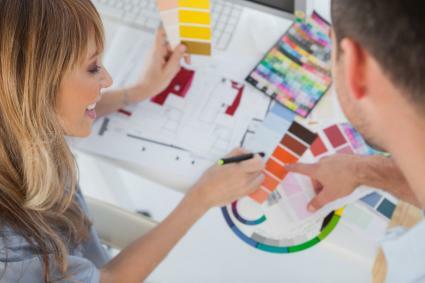 Contractors, painters and designers usually must pay for swatchbooks and fans unless they are a regular large account buying directly from the supplier or sometimes the manufacturer, depending on the volume of sales they generate. Each paint company creates and names its range of paint colors. These are grouped by the value of the hue and consist of light to dark hues. This grouping of values of one hue are called a color family. Examples of color families include black, blue, brown, purple, red, and neutrals. Pale colors aren't included in a color wheel, but are common. Pale colors are created by adding white pigment to the color wheel hues. White reflects all light and when mixed with a dark value, the hue becomes lighter and paler. Not only are color families shown in a paint color chart, but also in paint collections. These are groupings of specific colors that are separated and placed in a collection. Color collections can be anything from a simple off-white collection to historic or designer colors. For example, Benjamin Moore sells a Williamsburg Color Collection that are authentic representations of the historic Williamsburg homes. 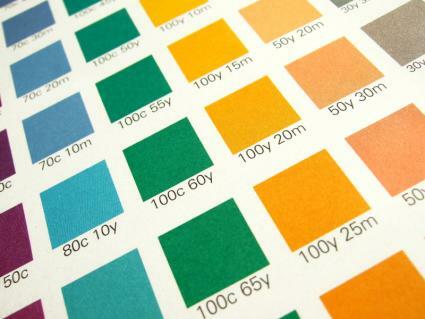 The palette of colors are set up on the paint color collection chart in the same gradation of hues as any other chart. After learning about the color wheel, you should have a good idea which color family you want to use for the main paint color. Decide on the type of paint you want and go to the store to view color charts. While companies have online charts and online capability to upload photos and try different paint colors virtually, it's always best to get a real paint sample and place it in the room you intend to paint. The light in your room will be different from that in the store and your computer monitor may display the color differently than what it actually is. Look over the various paint color charts until you find a few you light. Be sure you understand which collection and the cost of the paint before making a decision. Using the paint chart, you will quickly see that the color family gradation goes from light to dark values. If you wish to use a medium value, you can then select a lighter and darker value for trim and accent color. If you prefer to use a warm and cool color for greater contrast, then select hue values that are similar in intensity. The rule of three (using odd numbers in designs) is typically followed with interior paints. However, you aren't limited to just three paint color choices. In fact, you may prefer one wall color and one color for the trim and ceiling. Decide how many colors you want to use then seect a color chart to help you find the perfect color combinations. There are several ways you can approach using a color pain chart. The easiest way is to use the color family gradations on the chart. This is a failsafe way to ensure that the hues are all in the same family. Sherwin-Williams features several charts that includes Paint Colors by Family and several other collections, such as Pottery Barn, West Elm, and HGTV HOME™. The HGTV HOME collection is unique. Each color palette contains a collection of colors that according to the website, "Every color in this palette works beautifully together." In other words, whatever colors you choose from this collection were selected to go together in any combination of colors. For example, the Coastal Cool Color Palette features 20 colors ranging from light to dark values of brown, green, blue and aqua. You can use as many colors from the palette as you wish, knowing that whatever colors you select will make great combinations. When you select a color, such as Nurture Green, you are taken to a page that presents the color along with a color chart that ranges from dark to mint green. Coordinating colors of White Mint, Pure White and Pineapple Cream are also provided, although they are not part of the Coastal Cool palette. So, you do have the option of choosing other colors outside the collection. A photo of a room is displayed in your color selection located beside the paint chart and swatch. There is also a Similar Colors tab that reveals a wide range of various green colors. One more tab, Details, allows you to pull up all green paint colors offered by the company. The palette choices populated with only colors that can be combined in any number is one of the easiest ways to select the colors you want to use. Another way to approach selecting the paint color for a room is to go with the current color trends. Benjamin Moore's Color Trends 2016 Color Palette is a geat example of saturation and intensity of colors within a collection. Benjamin Moore chooses their own "color of the year". In addition, the company offers the color palette for the year that features a wide range of color families from cool to warm colors. Goes Great With: Two coordinating colors, typically a light and dark hue or value of the same color, are suggested. Similar Colors: This chart gives a gradation of values of the same hue. More Shades: This chart features several very light hue gradations and very dark ones. The More Shades chart is an excellent tool for selecting a lighter shade of the color you like. In addition, if you decide to be creative and go with a monochromatic (many values of one hue) color scheme, this type of chart is very helpful. You can use it to select the different paints you want to feature in your room. For anyone who wishes to use authentic historic paint colors, Valspar Paint features the National Trust paint collection. This collection is grouped by color families into five charts. Much to the frustration of designers and colorists as well as homeowners, the paint charts aren't arranged in any real order of gradation. In fact, they are a random mixture of light and dark values. Even the color families aren't easy to follow. For example, the Stately Greens have several brown hues within the chart. However, this doesn't mean that using Valspar color charts isn't without worth; their virtual room painting section is valuable for creating an entire room's look. The best way to use these charts is to take advantage of the website's online "room painter". The room painter will hold three colors and you can select where to apply the colors. You can save color choices to use later or you can use immediately to create a room or exterior project. There are stock photos for you to use to test out your color choices or you can upload your own photos of your room. While two possible colors are given, they aren't necessarily from the same collection. You may find one or two colors within one of the five color family charts, but you may need to select your trim and/or ceiling colors from a different chart within the collection, depending on what hue you wish to use. Some companies like BEHR breakdown color schemes for you and put the concept into an easy to follow color palette. This approach presents you with a main color and three other colors. The best way to use this feature is to look through the various color charts and find one color that you truly love. Since color collections often change, you can find the latest choices by clicking Colors and then Paint Colors. Browse through the various paint collections that are separated into various groups and collections, such as By Color Family, By Decorator Style, Popular colors, and then specific collections. When you click on the color you want, it is displayed on the upper righthand side of the chart. Simply click on Details and you are taken to a page with the photo of a room and several color palettes selected for the color you chose. You then have the option of selecting colors from the palette and virtually painting the room to test out your selections. The color palette chart takes the guess work out of the equation and presents you with professionally selected color choices. A great feature on the BEHR website allows you to save projects. You can save paint samples, then view them in various rooms. In addition, you can also upload photos of your room and then virtually paint it with your color selections. This tool helps you avoid costly mistakes in color selection. Using the professionally selected color palettes can save you money, time and frustration in deciding on the accent colors to go with your main paint color. You can use paint to draw the eye into a room design the same way you would with a framed and matted photo or painting. The object of this color layering is to draw the eye past the frame (the room's outer dimensions) into a first and then second colorful mats that step deeper and deeper into the photo or in this case, your room. Glidden Paint offers two great way to do this. This concept can be recreated in paint color choices by selecting the main color for the walls, followed by color selection for the ceiling, then the trim work. If you have other architectural features you wish to accent with color, such as wainscoting, chair rail, panels framed with molding and other accents, then you may decide to use either gradation colors or different color families in your design. Glidden also has pre-selected coordinated paint color charts that help you with your room design. When you go to the website, the paint drop-down menu offers you two choices either Color Palettes or Rooms by Color. The Rooms by Color allow you test out the paint color in a specific room, such as a den, bedroom, kitchen and other rooms in the house. If you click on Color Palettes you find this is divided into color families. The color range is stated with names like Red & Magenta or Yellow & Gold. These represent the color value range for each color family. Similar shades: Ginger Ale is a sightly darker value while the Yellow Duckling is lighter. Coordinating colors: Swan White is a light greenish gray and Shaded Brook is a darker value. Once more, you will decide which color you wish to use in coordination with your main color. You can click Next to go the next color within the yellow/gold family. Each color has four additional color suggestions to help you choose the right colors for your room. Some manufacturers are very meticulous about color gradation while others aren't with color gradations that don't follow a natural color progression of light to dark. When building a room decor around a paint color, be sure to start with a color you love and your project will evolve into the perfect room design.